SDSU senior guard Aqeel Quinn goes up for a shot against UC Riverside. Courtesy of GoAztecs Facebook. San Diego State men’s basketball team was left out of the Associated Press Top-25 poll announced on Monday for the first time in 23 polls. SDSU began the season ranked No. 17 in the poll, the highest the preseason rank in program history. Three losses, though, to Arizona, Washington and Cincinnati contributed to the Aztecs being left out of the top-25. However, SDSU did not fall too far and are ranked No. 27 in the AP poll, and landed at No. 24 in the ESPN Coaches poll. The Aztecs answered on Monday with a blowout win against UC Riverside 61-33, a game that will be remembered for the scary collapse of senior forward Dwayne Polee II. The win was SDSU’s 46th straight against California teams. Senior guard Aqeel Quinn got off to a hot start scoring SDSU’s first 12 points in a little over four minutes. Quinn led the team with 18 points, and went 5-8 on three-pointers. “It was good to have AQ get off to such a hot start, it set the tone for us offensively,” assistant coach Brian Dutcher said post-game. As a team, SDSU shot 27 three pointers and converted on eight of them. SDSU also committed just nine turnovers, less than half the amount in its loss to Cincinnati, and was a good sign for a team that has struggled hanging onto the ball this season. The Aztecs will keep it local in their next game when they face NAIA opponent San Diego Christian Saturday night at Viejas Arena. 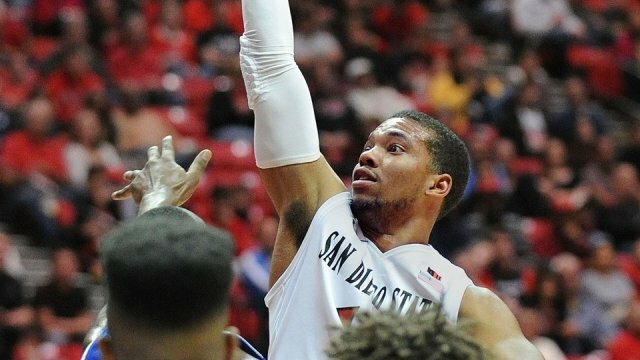 After San Diego Christian SDSU will begin conference play against Air Force on New Years Eve at Viejas Arena as well.